In a dramatic finish at Siemens Arena, Lietuvos Rytas held on to beat Brose Baskets Bamberg 67-62, but the visitors claimed the tiebreak advantage between them on a John Goldsberry basket at the buzzer to keep the German champs’ fate in their own hands going into Game 10. Both teams now sport identical 2-7 records, as does Partizan mts Belgrade. 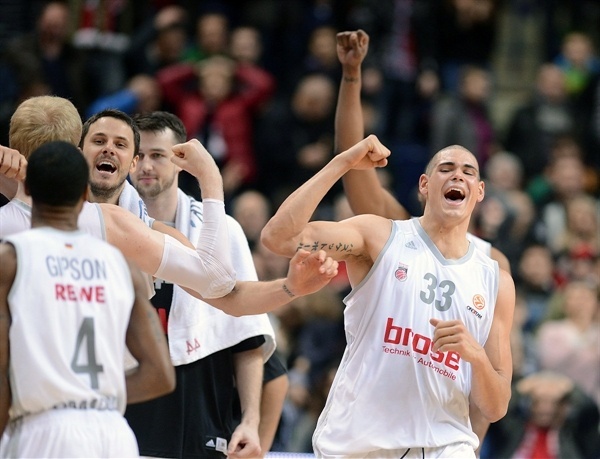 Bamberg will reach the Top 16 from Group D if it beats Partizan next week in Germany. For Rytas to claim fourth place and a Top 16 berth, it must beat Besiktas on the road in Game 10 and hope for Bamberg to lose. Had Goldsberry’s last second shot missed, a win for Rytas next week would have seen it through regardless of other results. 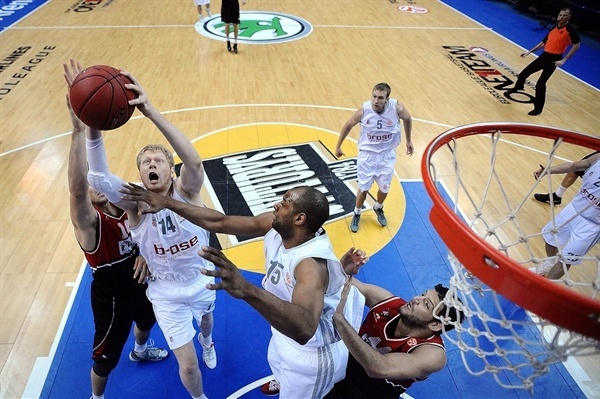 Rytas never trailed on Friday and led by as many as 12 points in the third quarter. Bamberg rallied back and got within 61-58 with just under two minutes to go. 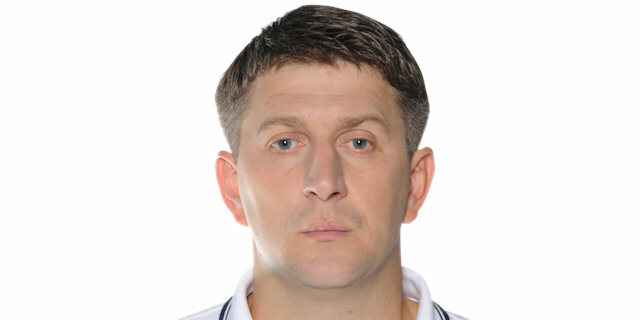 Rytas responded and pushed the lead to 8 in the final minute, but when the game became a free throw battle, Radosevic split a pair with 5 seconds to go and Sharrod Ford got the rebound, was fouled, made the first and his missed second free throw allowed Goldsberry to score the crucial basket at the buzzer. Renaldas Seibutis led the hosts with 19 points and 10 rebounds and Radosevic tallied 11 points and 9 rebounds. 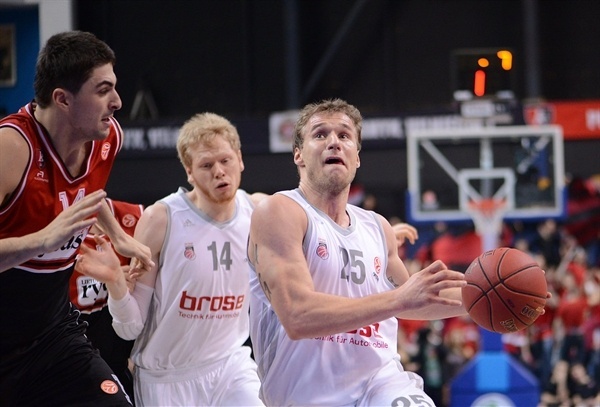 Bostjan Nachbar and Maik Zirbes netted 12 apiece for Bamberg and Casey Jacobsen added 10. The early minutes were for the hosts as Mindaugas Katelynas and Seibutis made it 4-0 while the visitors’ hoop seemed to have a lid on it. But three-pointers on back-to-back Bamberg possessions by Jacobsen and Nachbar tied things at 6-6. Rytas provided the highlights – including a missed dunk by Nemanja Nedovic and a rejection of a Teddy Gipson fast break layup by Leon Radosevic – but was unable to pull away. 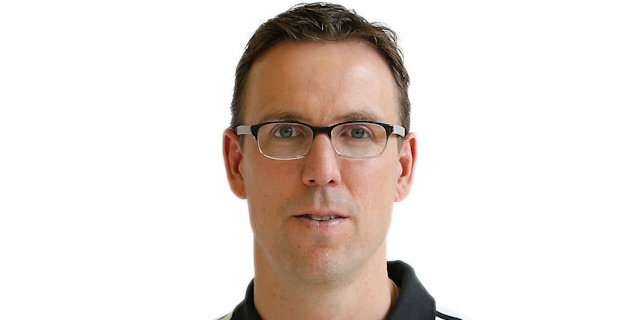 Nachbar drew Bamberg within 9-8. Seibutis inside and free throws by Radosevic carried the hosts to 15-10. Despite missed free throws, Bamberg hung tough and tied the score on a Karsetn Tadda triple with a minute left in the quarter. Blums missed at the buzzer, leaving the score at 15-15 through 10 minutes. 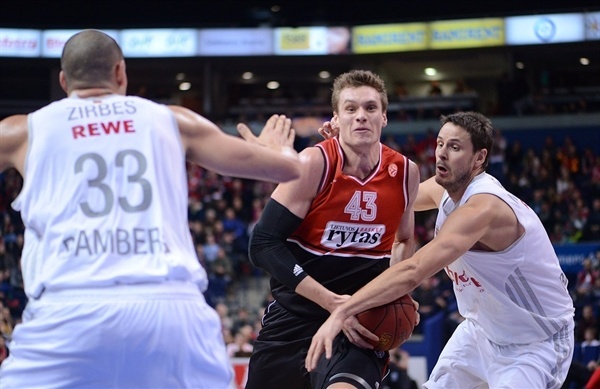 Bamberg struggled offensively at the start of the second quarter and Rytas took advantage at the other end. Steponas Babrauskas put the hosts on top from the line before Blum connected from downtown. Dejan Ivanov soared to slam back a missed Deividas Dulkys layup and after Blums stole the ball from John Goldsberry, Bamberg coach Chris Fleming called timeout with his team trailing 24-15. Anton Gavel came out of the break with a three to try to spark the German champs. Seibutis and Gavel traded spectacular baskets in the paint as the intensity remained. Nachbar added a runner to bring his team within 27-22 with four minutes left in the half. Bamberg battled on using a press on defense, while Nachbar, Tadda and Gavel all made free throws in closing the gap to 29-28. 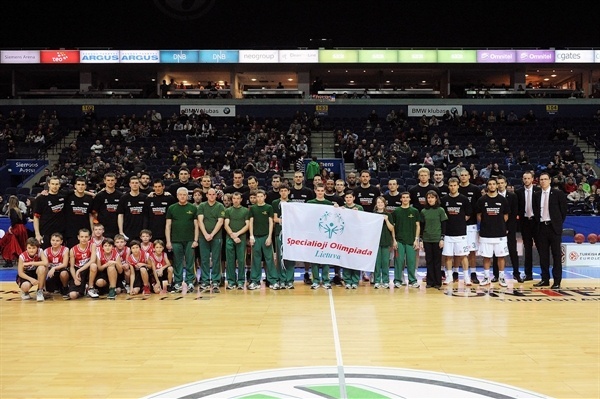 But Nedovic made a three with a man in his face and Simas Buterlevicius also connected from deep to give Rytas a 35-28 halftime edge. Seibutis kept the Rytas momentum with the first bucket of the second half, but Zirbes countered with his first points at the other end. Buterlevicius’s second three gave the hosts their first double-digit lead of the night. Seibutis buried a pull-up jumper as the lead increased to 44-32 midway through the quarter. Jacobsen breathed life into Bamberg with a deep three. Then Zirbes got going inside as the visitors clawed their way within 46-41. Seibutis free throws and the first points of the night for Predrag Samardziski on the offensive glass kept Vilnius in control. Jacobsen’s drive narrowed the gap to 50-43 through three quarters. Goldsberry connected from behind the arc and then sank a baseline jumper as Bamberg stormed to within a basket. Blums banged in a deep triple to earn some space for Rytas, 55-50. Seibutis added a jumper and Siemens Arena was rocking again. A Nedovic steal and slam made it 59-52 midway through the fourth quarter. Radosevic responded to Tadda free throws with a jumper as the hosts remained in control. Even as the outcome was looking to be Rytas’s, the margin of victory played a big role down the stretch. A Jacobsen layup made it a 5-point game with two minutes to go. Then a Gavel steal led to another Jacobsen score, this time on the break, and Rytas called timeout with the lead down to 61-58 with 101 seconds remaining. Ivanov scored a quick basket for the hosts and Zirbes dropped a pass inside. Seibutis got to the line and split free throws just inside the final minute. A Radosevic reverse layup with 24 seconds left iced the victory, 66-58. Nachbar got to the line with 6 seconds to go, but missed the first and made the second. 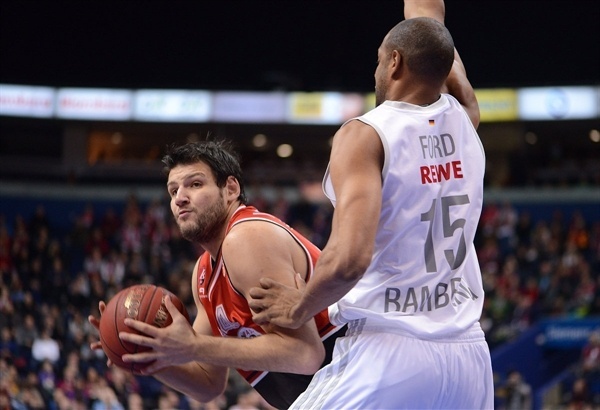 Bamberg quickly sent Radosevic to the line and the big man split a pair. Ford grabbed the rebound and was fouled with 2 seconds left, down 8. He made the first, but missed the second and Goldsberry darted in to grab the rebound and score at the buzzer, leaving the tiebreaker in Bamberg’s hands. "We lacked power in the paint, but had many good chances to shoot from long range. It’s a pity that we didn’t use our chances properly. What can I say about the end of the game? Players must box-out all five opponents, not only four. " 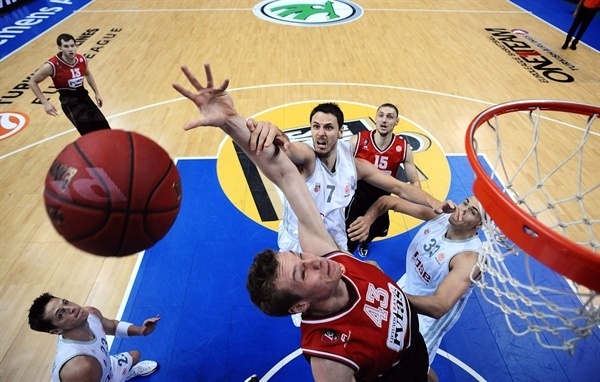 "Lietuvos Rytas invested more energy and emotion tonight and deserved to win. From our side I think it is not that often that team can play that bad and still finding something very positive. We are happy to keep control in our hands for the last game of regular season."